Difficulty breathing through the nose is a pretty common problem treated by ENTs. Initial treatment may consist of decongestants, antihistamines or other medications to open air passages. Many times treating the underlying condition like chronic sinusitis or allergy is all that is necessary. Sometimes the problem is caused by the structure of the nasal passages. If the nasal obstruction is caused by a septum that is not in the proper form, surgery may be necessary to correct it. If your ENT suggests septum surgery (septoplasty), don’t panic. Here’s what you need to know. Septum surgery is performed on the interior of your nose. While you might have some slight swelling immediately after the procedure it should be minor and disappear quickly. You shouldn’t have bruising under the eyes or in the cheek area. 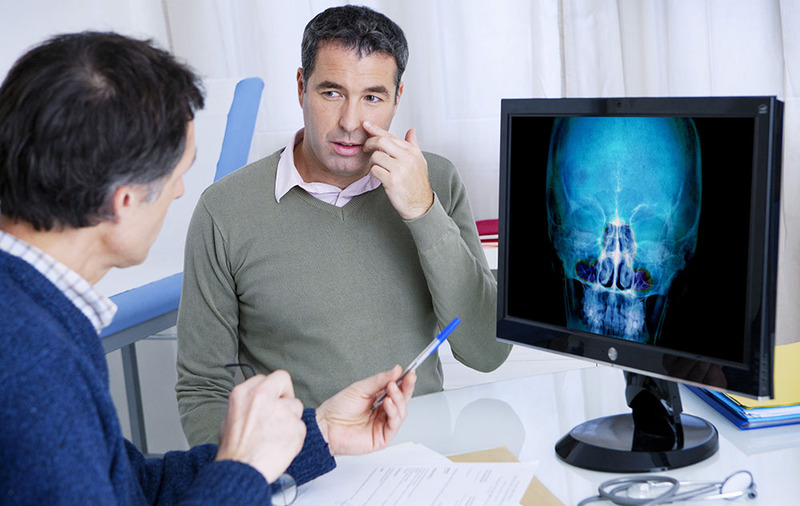 Sometimes septoplasty will be performed in conjunction with other surgery to the sinuses or turbinates. Septum surgery doesn’t change the appearance or the exterior shape of your nose. Once you have recovered, your friends will never know you had surgery except if they notice you are breathing much easier! The septum is the cartilage and bone that divides the nasal passages into two sections. The septum should be straight. However, some people are born with a septum that is slightly crooked. The septum can also become misaligned as a result of accidental injury. As we age, gravity exerts force on our bodies and the nose is not immune. As the nose shifts shape; the septum can lose alignment. When the septum is not in line, it is referred to as “deviated”. Septoplasty corrects the deviation by removing the bone and cartilage and reforming the septum in the proper shape. As a result, the obstruction is removed and the airways are restored to the proper condition. Breathing becomes much more relaxed and normal. Your ENT will examine the interior of your nose with a specialized instrument known as an endoscope. This allows the ENT to see the shape and structure of the septum as well as the surrounding area. While other imaging techniques can be used (such as a CT scan) the endoscope is usually all that is necessary to correctly diagnose the deviation in the septum. The septum surgery is performed under general anesthesia. It is done on an outpatient basis, so you will not need to spend the night in the hospital. You will need to let the ENT know all medications and supplements that you take and follow the ENT’s instructions for preparing for surgery. Some medications may need to be stopped up to two weeks in advance. On the day of the procedure (and during the recovery period as well) it is important to wear button down shirts and other clothing that does not need to be pulled over the head. During the actual procedure, your ENT will gently lift the mucous lining from the cartilage, reshape the cartilage and bone and then reattach the mucous lining. Depending on the work that is necessary you may need nasal splints or packing after the surgery. You can ask your ENT about this in advance if you have questions. Recovery generally takes a few weeks. For the first few days you may have some blood and mucous draining. This is normal. The feeling of congestion and swelling inside the nose is also normal. This will go away in about a week. Pain after surgery is generally mild and easily controlled with oral medication. It is important to refrain from strenuous activity until the ENT gives you the all clear. During recovery you may be instructed to irrigate the nasal passages with a sterile saline solution. It is important to follow the ENTs directions on irrigation and bandaging. Septum surgery may result in a brief period of mild discomfort but it is well worth a lifetime of breathing more freely.